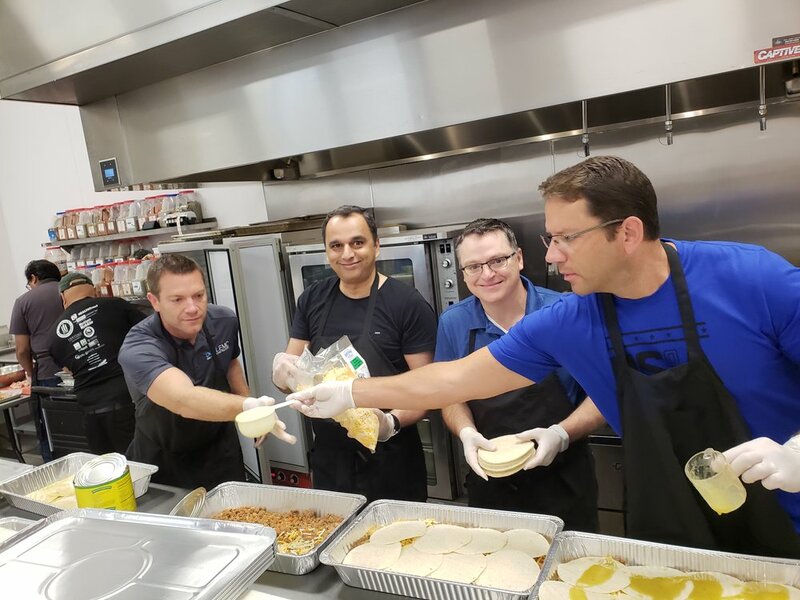 Corporate volunteering is a fun and effective way for larger groups to work together creatively and in a friendly environment, all while giving back to the community. Employees return to the workplace motivated, connected, and inspired. We provide all the ingredients and all you need to provide is tax-deductible donation and the helping hands! A hands-on experience that creates camaraderie within your team while making a difference in our communities! We will provide all the materials-on campus or off-site-you and your teams will need to assemble these kits. How do I set up a Team Building volunteer opportunity? Please fill out our Team Building Inquiry form below. A Loaves & Fishes staff member will contact you to discuss your team building preferences. We will work with you to customize and schedule an event for your team. Prior to your event, your volunteers will need to fill out our Volunteer Agreement form. What kind of groups can participate in Team Building events? Groups of any kind-corporate groups, faith groups, schools, groups of friends, and the list goes on-can participate! Teams contribute a tax-deductible donation to cover the cost of materials, staffing, and transportation. More importantly, this support allows us to provide even more nutritious meals for families, children, seniors, veterans, students, the disabled and the homeless throughout Santa Clara and San Mateo counties. Your team’s contribution is crucial in helping us feed our neighbors in need. How much do we donate to host a Team Building event? Brown Bag Lunch Program: We request a donation of $1,500 for a typical event size ranging up to 40 volunteers per event. Hygiene Kit Building: We ask for a donation of $1,500 for a minimum of 200 hygiene kits to be assembled at a single on-site event. We can easily accommodate larger quantities for a kit build; however associated costs do go up. We are happy to discuss in advance your kit build needs depending on the size of your team of volunteers.